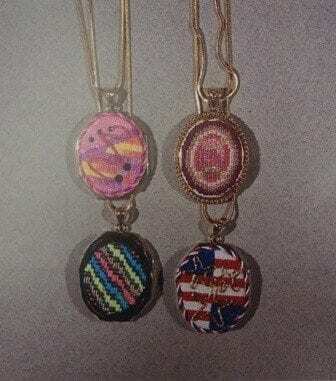 Stitched on 24 count Congress cloth, these four necklaces each have their own theme and use threads to carry out the design. Chocolate Covered Cherries is done in the colors of a delicious chocolate covered cherry. Star Spangles is stitched in, red, white and blue. Bargello Stripes is on black congress cloth. Spring Swirl is shown in peach, amethyst, rose, fuschia, and violet. These four fronts come with a gold chain and pendant for finishing. Additional pendants may be order from us. This jewelry works up very quickly and makes great gifts.